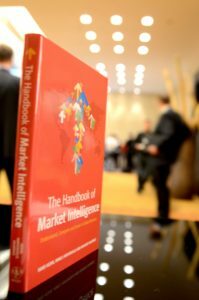 Now into its third print-run due to its popular demand, the Handbook of Market Intelligence has been described as a "must read" for market intelligence professionals. Amazon reviewers rate the book a 4.5 out of five. Global companies spend millions of dollars on conducting market intelligence each year. Yet only 10% have achieved market intelligence capabilities that are truly world class. Such companies enjoy much higher efficiencies in decision making and strong return-on-investment on their Market Intelligence budgets. What are their secrets? What can the other 90% do in order to ensure they have their market intelligence scope, processes, deliverables, tools, organization and culture right? Get an insider’s look at how some of the world’s most respected international companies use market intelligence. This book provides over 40 enlightening case studies from companies such as ABB, Cisco Systems, Dunkin’ Brands and Statoil, as well as findings from global surveys on market intelligence programs and trends. Buy the Handbook of Market Intelligence on Amazon. It also features a step-by-step roadmap to help companies raise their intelligence ambitions, by using the six Key Success Factors outlined in the Market Intelligence Roadmap developed by M-Brain. Readers will be able to implement the practical ideas immediately and drive the systematic development of their own world class market intelligence functions ““ as well as benchmark their own results against global best practices. The Handbook of Market Intelligence is available for sale on Amazon. M-Brain is the world’s leading supplier of media intelligence and market intelligence solutions offering best-in-class intelligence services and software through a workforce of 500 global analysts and a powerful suite of proprietary technologies. Operating from 13 countries across the globe, M-Brain is renowned for delivering superior visibility and bringing clearer understanding to organizations seeking greater media and market awareness. So, you are interested in our monitoring services? So, you are interested in our intelligence services? So, you are interested in our advisory services? Please, leave your contact information and we will get back to you shortly!